We forget that working class people are the first victims of polluting industries, either as workers directly affected or as residents of poorer areas which tend to be located closer to polluted or polluting sites. But more than that, we also forget that working class people are often at the fore-front of actions against pollution and environmental damage. Here we refer to actions of chemical  and steel  workers in Italy, to resistance of working class people in India , to protests against polluted water and soil in the rustbelt of the USA . In Southall, the state closed down many public services for the mainly migrant local working class – people have to travel far to get to the job centre or hospital. But the area has a history of self-defense. Over the years, migrants have come to Southall to work in the industries that have developed successively in the area, which is now one of the most overcrowded and polluted areas in Europe – and one of the most deprived in the UK. Developers have had their greedy eyes on this vast plot of land for a while, especially since the new Crossrail is supposed to connect Southall to central London in less than 20 minutes by the end of 2019. But planning permission had first been refused by Ealing council, following a successful campaign by local residents concerned by the high level of pollution on the site, the congestion the development would cause in an already overcrowded area, and the lack of social housing in the proposed plans. However, in 2010, London's then mayor Boris Johnson overruled the local decision and forced the project through.. Not surprisingly, the land has been bought by the developer Berkeley Group, whose director, Tony Pidgley, has been a close friend of Boris Johnson for many years! Berkeley Group now has permission to build 3750 new homes over a 25-year period. The cleaning of the large plot of contaminated land was begun in 2017. Since then, the residents of Southall have had to breathe in highly toxic gasses released into the air – which include benzene and other cancer causing chemicals. Many residents have reported ill effects like headaches, nausea, asthma, chest infections, etc. They're also concerned about the long-term effects of this 25-year development on the health of local residents, and especially on children and the elderly. While the health authorities are saying that people living on the new development should not eat any vegetables grown in their new gardens, the Political Leaders of the Council are taken on luxury holidays by the Berkeley Group! After complaining in vain to the appropriate Council departments, local residents began to raise their concerns to local Councillors and MP's, as well as executives of the Berkeley Group. 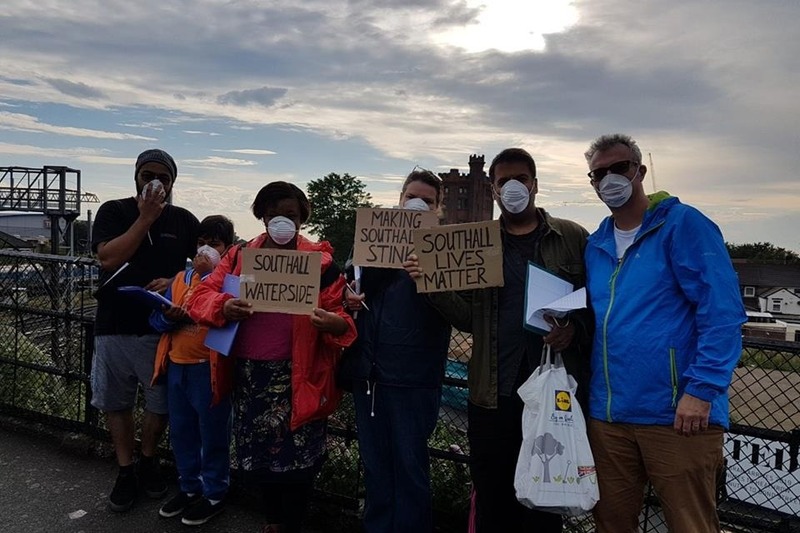 Realizing that their queries fell on deaf ears, they began to print and distribute leaflets locally, to raise awareness about the dangerous chemicals that all residents of Southall and Hayes are being exposed to - and who is responsible. A public meeting was organized early this autumn to address concerns and gather signatures for a petition. Since then, leafleting and protests have continued around the construction site, despite constant bullying by the developer. A group of angry residents even disrupted the Annual General Meeting of the Berkeley Group, passionately voicing their concerns in front of stunned executives and shareholders. Finally, tired of getting no support from local politicians, a group of residents entered the private meeting of the Constituency Labour Party, where the Leader of the Council was attending. Some local Labour Party members were shocked to learn about the health hazards and many now demand that the Leader of the Council – who is known to have gotten money and luxury holidays from the Berkeley Group – takes proper action. Ealing council and Berkeley Group work hand in hand. Until now, they have not answered any of the concerns local residents have raised. They are more interested in selling their luxury flats to the rich than providing Southall's residents with proper housing and a healthy environment to live in. Join the weekly protest (see the facebook page for details)! Ealing council and Berkeley Group work hand in hand. Until now, they have not answered any of the concerns local residents have raised.